The UNDP’s latest Human Development Report 2013 (entitled “The rise of the South”) has one particularly striking chart that it uses to make the point about the recent growing economic significance of some “emerging” nations. 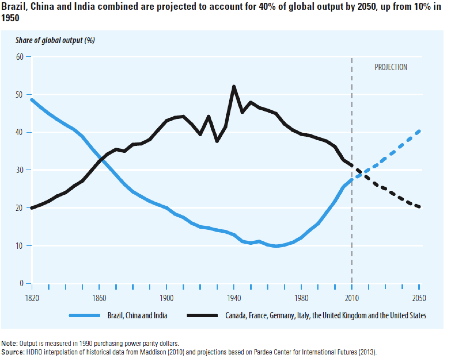 In Chapter 1, Chart 3 suggests that just three countries (Brazil, China and India) together account for around 30 per cent of global GDP already, around the same as the total share of large Northern countries (Canada, France, Germany, Italy, the UK and the US). If this were an accurate representation of reality it would mark a truly astounding change over the past three decades. but since the output of different countries is measured in terms of 1990 PPP dollars, rather than nominal exchange rates, this greatly exaggerates the extent of change. With nominal exchange rates, the rising trend share of these countries is still evident but not so marked: the GDP of these three countries in 2011 accounted for just above 16 per cent of world GDP according to IMF, (around half of the ratio estimated by the HDR) and their share of total merchandise exports is just above 13 per cent according to the WTO. Since international trade and capital flows still do occur at nominal exchange rates, it makes much more sense to use these when comparing anything involving cross-border flows. For the same reason, nominal rates are the relevant ones to compares shares of global income as well. But since the mid 1980s, this method has been criticised – and effectively abandoned by most international organisations – because of the well-known fact that the purchasing power of different currencies varies dramatically in the actual countries where they are used. The economic theory behind this is that exchange rate comparisons of less-developed economies consistently undervalue the non-traded goods sector, especially labour-intensive and relatively cheap services, and therefore underestimate real incomes in these developing economies. (For example, one US dollar can buy far fewer goods and services in the United States than 42 rupees can in India.) So the current tendency is to use “Purchasing Power Parity” (PPP) estimates to deflate incomes in different countries, based on the “Penn World Tables”. As a result, total incomes in countries with large poor populations like India or China increased by multiples of around 3 with the PPP estimate, compared to the nominal exchange rate estimate in 2000. This is what has led to the grandiose claims of China becoming the second largest economy in the world or India even reaching sixth position in the global economic ladder, based on the assessment that our currencies command several times more goods and services than are reflected in the nominal exchange rates. However, there are major problems with the estimates of income using exchange rates based on PPP, quite apart from the obvious issue of what actually constitutes a global income share of a country. The most significant difficulty is that of deriving the actual price comparisons. Obviously, PPP calculations should be based on comparing the prices of identical (or at best very similar goods) in different countries, and these should in turn be the goods that are most commonly represented in total expenditure. But this is easier said than done. It is almost impossible to find identical goods across different countries, which dominate consumption and investment. The second – and even more daunting – problem is how to find the actual prices of such goods and services, and what to take as the representative price of each. This obviously has to use either existing price data or data from surveys that are constantly updated. But this is also very difficult especially in most developing countries, including very large ones. There are real concerns about the poor and often outdated quality of the data on actual prices prevailing in different countries (including large developing countries such as China and India) that are used in such studies, which affect the reliability of such calculations. Until recently there were no major surveys or even careful estimates of prevailing prices in India and China, so that the PPP estimates before 2005 were based on very outdated evidence on prices. When the 2005 data were adjusted to include some newly collected information on prices in these and some other countries, big changes emerged. The 2005 PPP-adjusted per capita income for China in US $ terms showed a 40 per cent decline compared to the 2000 estimate, because the new PPP for China is estimated to be around half the nominal rate, whereas the previous estimate (dating from 1993 but not backed by any serious survey) had suggested it was only around one fourth of the nominal rate. This downward revision of per capita income in China also adds significantly to the estimate of poverty using the standard US dollar per day definition, more than doubling the estimated number of poor people in China. But then there is a further problem in using a single PPP indicator over a long period, given the wide fluctuations evident in the time series data for many countries. The economist Sanjay Reddy has noted that “PPPs reflect the relative costs for a pattern of consumption prevailing at only one moment in time, and this pattern is constantly changing. … they merely present a snapshot of relative prices across countries at a point in time which is no more authoritative for intervening years than similar snapshots of the relative prices across countries taken at points closer to those years.” So using a single PP across several years can also give a misleading idea of time trends. There is a less talked about but possibly even more significant conceptual problem with using PPP estimates. In general, countries that have high PPP, that is where the actual purchasing power of the currency is deemed to be much higher than the nominal value, are typically low-income countries with low average wages. It is precisely because there is a significant section of the workforce that receives very low remuneration, that goods and services are available more cheaply than in countries where the majority of workers receive higher wages. Therefore, using PPP-modified GDP data misses the point, by seeing as an advantage the very feature that reflects greater poverty of the majority of wage earners in an economy. In other words, a country’s exchange rate tends to be “low”, or the disparity between the nominal value of the currency and its “purchasing power” tends to be greater, because the wages of most workers are low. A low currency economy is a low wage economy, which is hardly something that should be (even implicitly) celebrated. So enthusiastic headlines about the size of BRICS and other economies in PPP terms need to be used with caution, especially with reference to global economic power. Thanks for the interesting dissection Jayati. Of course the BRICS and other economies play both sides of the coin as it suits their interests. For example in discussions about governance reform at the UN, World Bank, IMF, etc – they are very fond of presenting the PPP-adjusted figures to show themselves as underrepresented. And they continually dismiss the kind of methodological issues you raise. But then again I am sure when it comes to financial issues, some cry poverty and the need for more aid (less so the BRICS but yes for other economies) – for example when considering graduation from IDA or other concessional borrowing pools. Either way I would prefer a different measure of global economic power than a simple GDP figure. Surely it would also take account of things like domestic poverty rates, outward FDI, trade prowess, and other measures. Any good composites out there? This is a very interesting and well written article. Thanks for sharing.